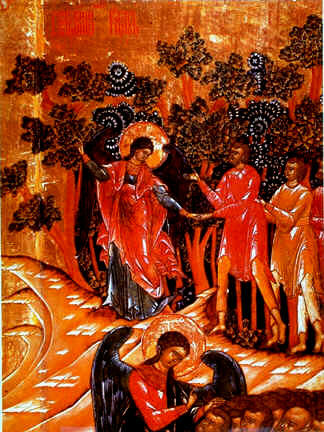 Out of the Divine Darkness has emerged the Ravenangel, testifying in the Holy Spirit as to the Mysteries of God: "Truth has come to you, O Earth, in the person of Jesus Christ who has revealed in himself the true nature of divine reality and authentic life" (1 John 5:20). Only those who love truly know God, for God is love (1 John 4:7-16). The love that is God, Divine Love, has created all things out of itself in its Parent aspect as Divine Nothingness. That which is primordially and eternally begotten is Divine Being, the Child aspect of God. Divine Being is the expressivity of God as love. The Holy Spirit is the primordial and eternal process of the Creative Will to Love in which Divine Being stands out of Divine Nothingness. Love is the essence, the very nature of Divinity. Divine Being, the Christ Child of the equiprimordial Divine Parent, Divine Nothingness, is this eternal Will of God in its expressivity as love. All existence and life in its primordial essence is the creative expression of Divine Love.The Body of Divine Being, Cosmic Christ, is existence as the creative finitization of infinite love. Divine Being is that primal, eternal process in which infinite Divine Love becomes incarnate in finite beings as the Children of Love. Comments regarding the Ravenangel Project?